In 2013 Amaterra has provided a $1000 micro-grant to support Camp E.L.I.T.E., a leadership and empowerment program designed for young men aged 14-18. The camp focuses on eighth grade students in Zambia. Two young men will be selected from their community and accompanied by a mentor to attend the week-long seminar. The camp is designed to encourage gender equality, equity, and life skills development. The program for boys will focus on Leadership, Gender Roles, Communication, Safer Sexual Practices, HIV/AIDS, Sports, Teamwork, and Life Skills. Upon completion, these young men will return to their community and work with their mentor to reach out and teach others in the community. This project is similar and parallels the “GLOW” project for young women. During the ELITE camp, each of the boys will partner with a boy from another community, and will work with a LIFE (Linking Income with Food and Environment) Peace Corps Volunteer. These LIFE PCVs will work hand in hand with the boys to teach them and then assist them in learning how to plant fruit trees in the orchard at Mansa Secondary School. There will be a minimum of 15 groups, each planting a tree. We will also be giving each boy one tree to take home and plant at their homes. They will be equipped with knowledge regarding Agroforestry and integrated conservation farming utilizing trees in their fields and gardens, and will be linked to three organizations in the Mansa Provincial capital that will provide them with access to trees and resources in the future. Each Group of boys will also receive specialized, Zambia focused environmental education on the importance of trees. We’ve invited the DFO – Which is the District Forestry Officer – from the Zambian Ministry of Agriculture, under the Forestry Department, to lead a presentation on the importance of trees and the protection of the environment. This is specifically focused on preventing the Chitemene (slash and burn) model, and on encouraging natural resource management – working to combat the massive forest and brush consumption by the rural charcoal production industry. As this is a major income source in rural communities, this is particularly vital in conservation efforts. Their final Agriculture focused sessions will dive into Integrated agriculture, agribusiness, and IGAs. We will have a presentation from highly successful local farmers who come from a village and rural background and poultry keepers on how to start up IGAs and what good business practices are. We will also talk a bit about cash crop agriculture and ask the boys to come up with a crop suitable for their area that could be grown to be sold at market, these crops will then be sourced (if seed is available) for their use to start a demo plot. As almost all participants are subsistence growers, this introduction to business skills and sustainable/eco positive crops is another essential part of the development cycle, both for income generation, and for land productivity. GRANT ARRANGED BY DAVID BERGER AND FUNDED AUGUST, 2013. A $1000 grant from Amaterra has been provided to Peace Corps Volunteers (PVSs) for a program empowering young women in Zambia, Africa. The program focuses on 8th grade school students. Each Peace Corps Volunteer brought two young women and a mentor (one adult) from their communities, to participate in a week long empowerment camp. 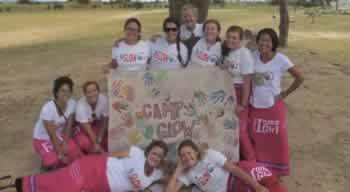 The camp focused on life skills, women’s rights, sexual health, nutrition, and leadership. Also the young women were taught about good food, the dangers of teenage pregnancy, communication, and good farming practices. Of special significance for the mission of Amaterra, each participant learned about home/kitchen gardens, composting, income generating agricultural activities focusing on sustainable practices, and food security. After the camp the two participants and their mentor returned to their community with the Peace Corps Volunteer, over the next six months the young women and PCV formed a GLOW (Girls Leading our World) club in their community and recruited young women in each zone to share the lessons they’ve learned and help support each other. The goal is that by the end of six months a minimum of 300 young women will have been trained and receive support from this program across the province. Six months after (within a year of their initial training) the groups will be asked to coordinate with their Peace Corps Volunteer and host Learning Exchanges with local schools and nearby communities, sharing their experiences, lessons, and successes/failures. Those young women they select in the community will be asked to form their own GLOW groups which will support each other within their WARD. The groups are encouraged to be self-sustainable from the beginning with the PCV’s acting as mentors, co-facilitators and supporters, not leading or dominating the programs activities. Amaterra Board Director, David Berger is in Zambia and has worked to help set up this program. We have been informed that, without our grant, the program could not have become a reality: a perfect partnership for Amaterra. The grant is being monitored by the Peace Corps volunteers with oversight by Peace Corps Administration with David providing additional monitoring and oversight on behalf of AMATERRA. See the video montage of the training, featuring the young women, their mentors, and the facilitating PCVs. Thank you Director David Berger for arranging this one.